引入標頭檔：例如#include <myLibrary.h> 或 #include "myLibrary.h"
^ Arduino - Introduction. 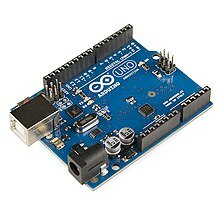 arduino.cc. ^ Justin Lahart. Taking an Open-Source Approach to Hardware. The Wall Street Journal. 27 November 2009 [2014-09-07]. ^ ChiuHao Chen. OPEN的力量：ARDUINO開放硬體計畫. [2016-03-06]. ^ M-SHORT. Installing an Arduino Bootloader. [2016-03-06]. ^ Arduino Single-Sided Serial Board (version 3). [2016-03-06]. ^ Redirect.... smartprj.com. [2016-03-05]. （原始内容存档于2016-03-05）. ^ Schmidt, M. Arduino: A Quick Start Guide. Pragmatic Bookshelf. January 22, 2011: 201 （英语）. ^ Arduino - ArduinoBoardMega2560. arduino.cc. ^ Arduino breadboard shield: $10 & 10 mins. todbot blog. ^ Arduino Shields for Prototyping. tigoe.net. ^ Jonathan Oxer. Arduino Shield list. [5 Nov 2013]. ^ Arduino Software Release Notes. Arduino Project. [December 7, 2018]. ^ Using AVR Studio for Arduino development. Engblaze.com. [2013-01-18]. ^ Arduino Software Release Notes. Arduino Project. [May 31, 2013]. ^ Using Atmel Studio for Arduino development. Megunolink.com. [2013-01-18]. （原始内容存档于2013-01-28）. ^ Programming Arduino Getting Started with Sketches. McGraw-Hill. Nov 8, 2011 [2013-03-28]. Arduino tutorial – broken into several lessons with photographs and suggestions for appropriate tools for beginners. Sheepdog Software's Introduction to Arduino："Getting Started" pages and sequenced programming tutorials, with help on hardware.